This project is bringing a sense of modernity to this neighbourhood. The suites are laid out with top of the line features as well as ample outdoor space, so you’ll always be able to have plenty of fresh air. 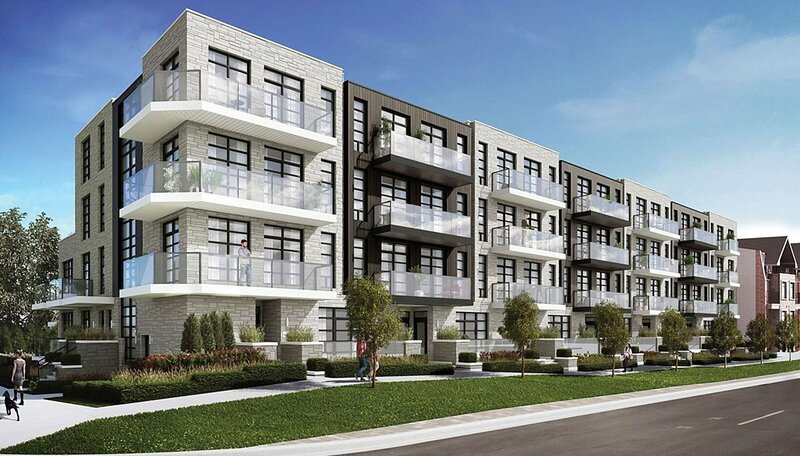 The Nova Urban Towns are a new mid-rise development coming to the thriving Newtonbrook neighbourhood in North York. Willowdale is one of the larger neighbourhoods in the GTA, so it is a fairly encompassing area. It has an employment centre, commercial district, nightlife, and not to mention some of the best public transit, in North York. This is where you want to be. This development is the modern imagining of the stacked townhouse. It will be 4 storeys tall and have 42 units, which will be divided into 38 two bedroom (+ den) units and 4 three bedroom (+ den) units. 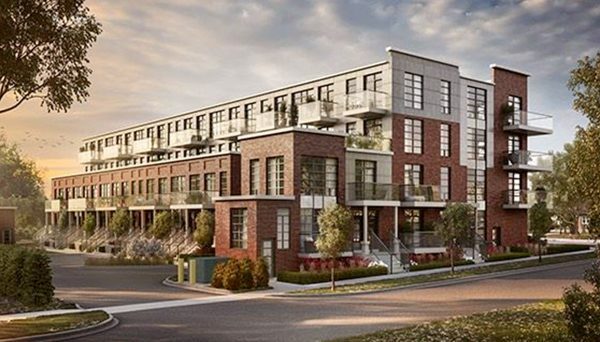 It is located on the southwestern corner of Finch and Elmview, and it will be mostly surrounded by existing low-rise residential housing, with the exception of across the street to the north, which is a mid-rise service building. Modernity was definitely kept in mind when designing these towns. All of the units are outfitted with soaring 9’ foot smooth ceilings, which give them a wide open vibe. The units are also equipped with European inspired kitchens and baths, as well as wide plank and porcelain flooring. The units all have large balconies and terraces too. So you’ll always have access to the great outdoors. If you want to get out to stretch your legs a bit more, there will also be a 1,582 square foot community park on site. The project will also see a new private driveway built into the property, as well as a bicycle storage room. It will also have illuminated walkways, so you’ll always feel safe in your community. This project is located in the Newtonbrook neighbourhood of North York, which encompasses a vast area, including North York Centre along Yonge Street. Despite Willowdale itself being massive, these towns will have an enviable position, being only a 7 minute walk away from Finch Station. This is the terminal station on the Yonge-University line, and it makes travelling across the entire city a breeze, and it’s about to get even better. This is because of the incoming light rail system of the Eglinton Crosstown LRT. This will vastly improve the transit throughout Midtown Toronto, as it streaks down the Eglinton corridor. This proximity to Finch Station also indicates that residents here will also enjoy premier access to North York Centre, the districts veritable downtown. This is one of Toronto’s most important commercial business districts, and it’s also the place to head if you’re hungry. The streets of the Centre are lined with eateries from pubs and cafes, to sushi and ramen restaurants, you’ll surely find something to satisfy your appetite. The proximity to North York Centre also provides a tremendous opportunity for investors and new home buyers because it is an employment centre, and because of the presence of Finch Station. With the use of public transit, residents can get to other employment centres in the city like the Financial District in 41 minutes or Islington City Centre in under an hour. Most young families and couples have two incomes these days, and with the city continuing to spread out, chances are the couple will need to travel to different parts of the GTA for work. Drivers won’t have a problem getting around either because of the Ontario 401 Expressway that’s in the vicinity. This is Southern Ontario’s most important thoroughfare, and it can quickly take you to all of the different communities in the GTA. Of course, a time will come when you’re looking for a new outfit, and lucky for you there are two of the city’s premier shopping centres nearby. Centrepoint Mall is to the north, and Bayview Village is in the southeast, and between these two places, we have no doubt you’ll find what you’re looking for. This is a great chance to own in one of the major up and coming neighbourhoods in the GTA. The proximity to transportation options is a great combination with the units all having a minimum of 2 bedrooms because parents of young families will likely need to work in different parts of the city. You shouldn’t miss your chance to invest in one of the area’s hottest projects. Register today! Boasting a successful track record, Kaleido Corporation locates and acquires land that is already primed for development. With over a century of combined experience, this developer contracts consultants, planners, architects, and builders in order to complete the building process. Kaleido takes pride in havy many projects underway --Some projects by this developer are Nova Urban Towns and Trafalgar & Dundas Condos.